The Virginia Bloggers Club. DC, MD, VA event promotions. : Cooperative Preschool of Loudoun: A Sweet Deal. 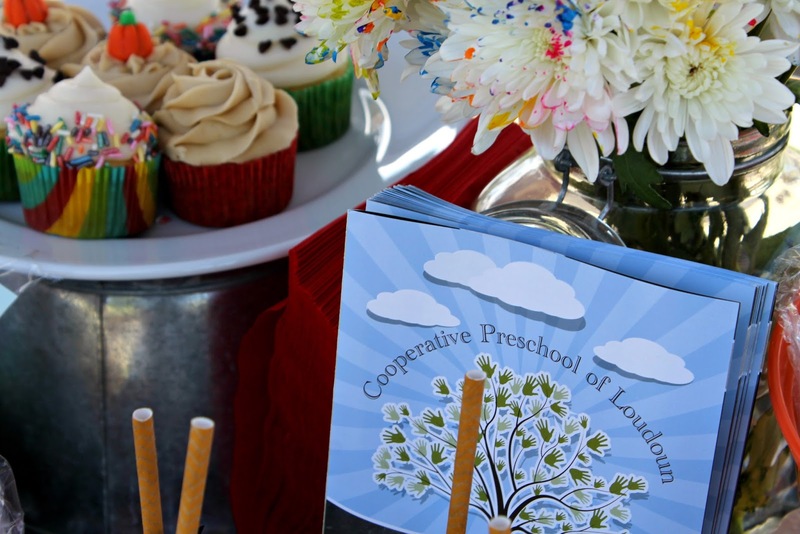 The Cooperative Preschool of Loudoun(CPL) is the only cooperative preschool in Loudoun County. "Cooperative" meaning the parents are involved in running the preschool and occasionally helping the teachers in the classroom(about once a month per child). It was not until my eldest entered kindergarten this year that I appreciated how precious it was to see my child in the classroom both interacting and learning. I now stand on the sidelines and watch my son enter our local elementary school each day. I am often left wondering what he is learning and how he is doing. There is no price that can be placed on being involved first hand in your child's early education. It is the way that it should be...as parents we are the original teacher for our children. Being involved is a natural and beautiful thing for everyone. Last weekend, we had our annual bake sale a Brambleton's Fall Fest. What a beautiful day indeed! In a cooperative fashion, the parents worked to bake a variety of homemade goodies to be sold. We are a non-profit preschool, so fundraising is an important part of what we do! We do fundraising to purchases important necessities for the classroom and to keep the school in tip top shape. The bake sale is a wonderful time to talk to the parents in the community. As I type, we still have some 3 year old "Junior" spots available at CPL. If you know of any parents with 3 year olds still looking for an incredible preschool please send them our way. We are happy to schedule a time to walk your family through the school, so that you may see how truly wonderful it is to be apart of the CPL family. Family is indeed the right word. We are a community of friends. This is an environment that gives your child the best head start possible and it involves the most important person in their lives: you. A big thank you to everyone who donated their time and talents to make the Brambleton CPL bake sale a success! A Big BIG thank you goes to Sugar and Spice Cupcakes here is Ashburn, VA. Her cupcakes are truly delicious.